VideoStrong is making some of the most popular – at least on this website – Android set-box boxes with digital TV tuner on the market with products like Mecool KIII Pro, or KI Pro, mostly because of their affordability. Software may be hit or miss depending on your local requirement (e.g. AC3 on DVB-T2, language encoding issues, etc..), so there’s fairly large number of users and some community tools or firmware such as DVB Channel Editor or Vitmos OS that may make them better devices. Most models are based on Amlogic S905 or S912, but Amlogic launched S905D processor some time ago with better tuner support (multiple demodulator support) which for example allowing me to watch terrestrial TV (DVB-T2) while recording satellite TV (DVB-S2) on Sen5 TV box. 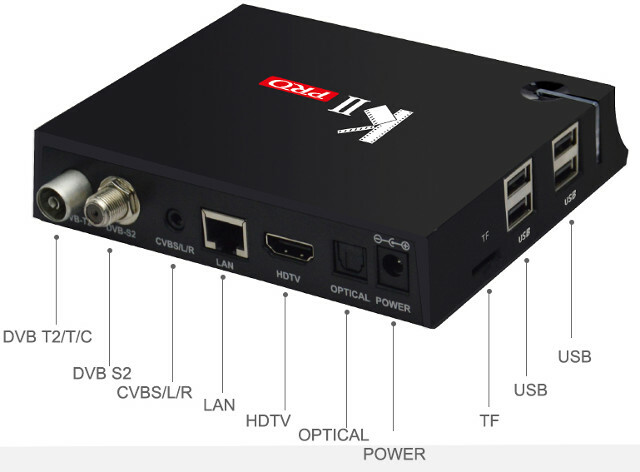 VideoStrong decided to upgrade their KII Pro Android set-top box with S905 processor, DVB-T2/T/C and DVB-S2/S tuners to the new Amlogic S905D processor, and the new version of the device also get some interesting firmware and software upgrade with support for Android 7.1.2, YouTube 4K, Widevine L1 DRM, Netflix HD, and MAC25X (IPTV) Stalker TV box compatibility. 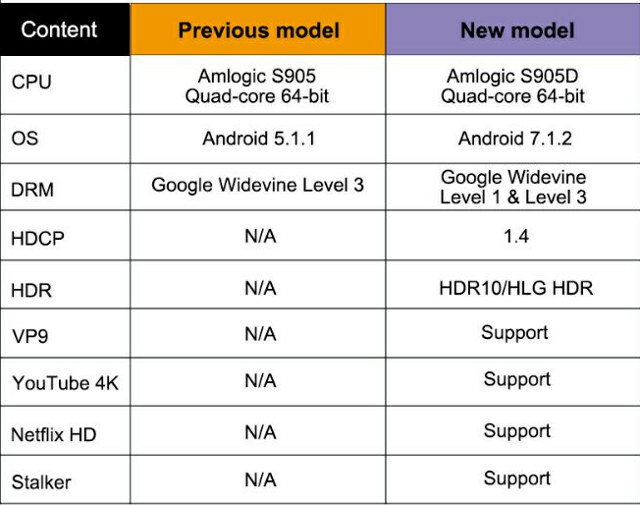 Going to Amlogic S905D from S905 also has the advantage of adding support for HDR, and 4K VP9 video codec. The company paid for a HDCP 1.4 license as well, but not HDCP 2.2 if the table below is to be believed. You’ll still be able to watch and record free-to-air TV, get access to EPG (Electronic Program Guide), and other features described in previous reviews. VideoStrong/Mecool usually have hidden features such as CCCAM/NEWCAMD support, and I’d expect the new model to be able to record one channel via cable/terrestrial antenna, and watch another via satellite dish. The new Mecool KII Pro set-top box is sold on GeekBuying for $66.99 including shipping, but you’ll also find it on Aliexpress, or GearBest. From time to time, I receive email asking “why can’t I receive free-to-air channel, I live in the US”. So please, if you live in the US, or another country where DVB-T/T2 standard is not in use, do not buy this box, unless you are interested in satellite or/and cable reception. In the US, people need to check for boxes with an ATSC tuners, in some other countries for ones with ISDB-T tuner. I do not understand, without DDR4, Gigabit … What’s the advantage over KI Pro with the same SOC? Forgit KI Pro was also based on S905D. In that case, the advantage is the cheaper price. Can AndroidTV be installed on this device, or on the KI Pro? Did some 3rd-party developer make it happen? Yeah, why not GbE, IIRC S905D supports it right? No mention of what tuner(s) are used. I bet it’s one of those horrible Availink things. It doesn’t work that way… device itself must have Gbit hardware (external chip). This has nothing to do with SoC supporting it. ma box et bloqué voyant bleu et j’ai du mal a la reparé y’a t’il un firmware d’origine pour kii pro S905D v 7.1.2 merci . Scusate, qualcuno di voi ha problemi col digitale terrestre?